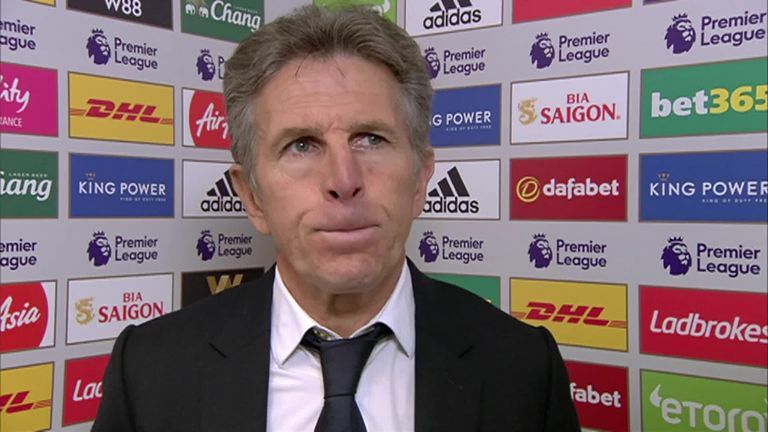 Leicester manager Claude Puel believes his side must improve how they start Premier League matches after leaving themselves with a "mountain to climb" as they were beaten 2-1 by Everton at the King Power Stadium. Richarlison's seventh-minute opener was the fourth goal Leicester have conceded in the first 10 minutes in the Premier League this season. Despite Ricardo Pereira levelling just before the interval, Gylfi Sigurdsson sealed all three points for the visitors with a brilliant strike after Wes Morgan had been sent off for the hosts. Puel refused to be drawn on whether Morgan ought to have been dismissed following his second yellow card, and preferred to focus on his side's short-comings. He said: "It was a tough game against a good team. It was a good balance between both but we didn't start very well without a good tempo and conceded early. I think we're giving ourselves a mountain to climb. We need to correct this. "We have to correct our start in our games. We were better against Newcastle last time, but another time at home [against Huddersfield], it was too slow at the beginning. "We tried to play from the back, but we needed to keep a good solidity. We have a young team and we have to correct this and learn of course." Leicester were the better side in the second period before Morgan was dismissed for a second bookable offense, a clumsy foul on Richarlison which might have gone unpunished. But Puel believes his side ought to have retained their attacking intent, despite opting to withdraw Kelechi Iheanacho for Marc Albrighton when faced with a numerical disadvantage. He added: "The sending off changed the scenario of the game. We played 10 against 11, but I think we had a feeling to go back and protect our box. It was not a good attitude from us, because we needed to continue playing our game. "We defended too deep and conceded a fantastic goal. We suffered, and tried to push at the end. We nearly scored in injury time [Daniel Amartey missed a free header from close range] but it was too late."